Carrots are a beautiful vegetable, and I believe any vegetable my three year old will eat to be particularly beautiful. This salad started out as a way to use up a very large amount of organic carrots I bought on special, not realising that I already had a very large amount of organic carrots in the back of the fridge. If there is one thing I hate it’s wasting food, and since one can only eat so many carrot purees, carrot cupcakes and steamed carrots in a week, my mum suggested grating them up into a salad. 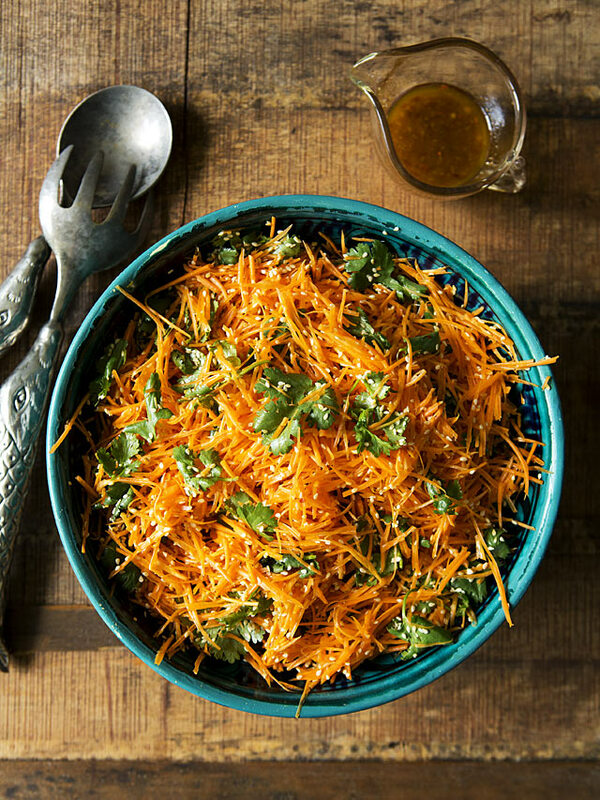 The combination of sweet crunchy carrot with coriander, nutty sesame seeds tossed through with the sesame oil dressing make it to be a salad which is delicious and satisfying. It partners well with steak, fish or chicken, and especially lamb. It is a good salad to take to a BBQ or pot-luck as it’s so pretty and it always attracts a lot of compliments both for flavour and appearance. An added bonus is it lasts a couple of days in the fridge without going soggy and the flavours develop even further. To make the salad I used a the Quick Slice Julienne Mandolin by Kuhn Rikon purchased on Amazon.com for about twenty bucks, which I love. I have purchased countless various mandolin slicers and graters over the years and they have all ended up at garage sales or being donated, except this one, it’s a keeper. Prep time: 30 mins, cooking time: 10 mins. Serves 6-8 as a side. 1. 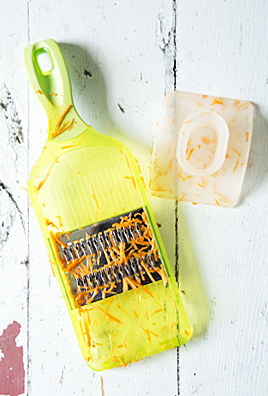 Wash and grate the carrots on a mandolin, then place in a large bowl. I don’t bother peeling carrots for this recipe, I’ll leave it up to you if you wish to. Pick all the leaves off your coriander stems and place in bowl on top of carrots. If you like eating the stems of coriander you may chop these finely and include them in the salad. Set aside. 3. Pour the olive oil, red wine vinegar, sesame oil and spices into a bowl and whisk thoroughly to combine. Pour dressing over the salad, toss and serve. I love Moroccan homewares, particularly shabby ones like my beloved turquoise bowl I purchased about ten years ago from Moroccan importer, Ambiance Interiors in Alexandria Sydney. The salad servers with the fish handles are from the local Goodwill, the little jug courtesy of the Salvo’s Mona Vale and the background was salvaged out of hard rubbish on the street. These shoots are always so much fun to put together and I love the creative process of making something beautiful out of other peoples cast offs. The only type of light used in this image is window light. I love your styling notes for this post Tanya! I have been lurking since your blog’s inception and have to comment now on how beautifully styled every entry has been. I really enjoy the back story for each shot and am happy to think of you happily foraging for great finds amongst the charity shops and hard rubbish! You are providing much inspiration for the baby steps that I am taking towards a more sustainable, thoughtful lifestyle… most of those steps are simply about thinking more carefully about my choices and slowly altering my mindset, but perhaps that’s the hardest stage of the transition from reckless consuming to simple living. Also, this looks like a great recipe- definitely on the summer BBQ list! Looks yum Tan 🙂 could you do that in the Thermie?? Looks gorgeous Tanya & isn’t it satisfying to create such a beautiful dish from such simple ingredients! I’m new to your blog & looking forward to trying out your recipes. I love your photo of this dish – as with so many of your photos, you capture a mood & a moment that stops me, & makes me want to stay in it, whether its food or people. Your photos inspire me. And what is it about Moroccan homewares !? I have a Moroccan tea caddy that is now quite old, and very loved. Love your blog! I love carrot and coriander together. This looks so good. I saw your link on Carole’s Chatter.